Sean Dietrich headlines a fantastic night of fundraising for the Lee Conlee House. 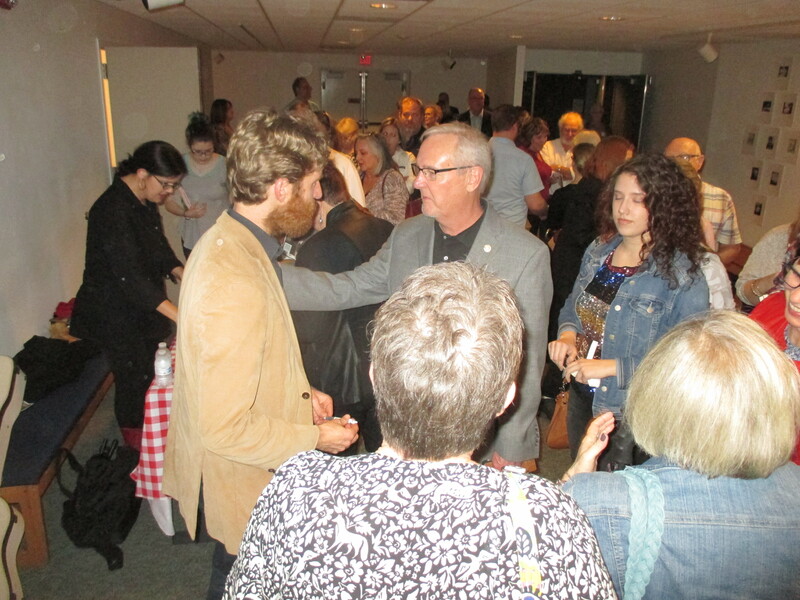 Sean Dietrich (tan jacket) talks with St. Johns River State College president Joe Pickens after show. Somewhere along the line you learn not to trust whatever follows the words: The truth is …. But the truth is you’ve got to go meet a guy named Sean Dietrich. He’s a storyteller/singer who’s also a published author. But most important, he’s a man who will give you a bit of hope. On Friday he was spreading that hope in the auditorium of Florida School of the Arts on the Palatka campus of St. Johns River State College. He was the night’s entertainment for a fundraiser for The Lee Conlee House, the Putnam County domestic violence shelter. And, yes, it’s a shame anyone needs a domestic violence shelter but unfortunately you won’t find anywhere that doesn’t need such a place. The Conlee House offers a refuge for women and children, men and the disabled – all those people someone else takes their rage or their shame out on. Anyway there was Sean Dietrich (“Sean of the South”) up on stage playing “Fly Away” on a wooden guitar, telling the audience it’s a song his mother loves. And then he started telling stories about his life and his mother and his father. Stories about the FEMA trailer with the working toilet that he bought in New Orleans for $3,000 and hauled back to his mother. How his daddy killed himself when Sean was nine. The teachers who thought he used too many commas. How he went from a middle school dropout to a college graduate. Somehow he tied it all together, even back to the teacher who didn’t encourage him and the one who did. An hour plus passed and the audience came out of what was a bit of a dream with a touch of a revival and a hefty dollop of humor. If you missed that show, find where he’s speaking next and make a point of going. The one for Sunday was about Palatka. About eating at Angel’s Diner and visiting Peniel Baptist Church where a young Billy Graham preached. About meeting people and finding his daddy. They’re the kinds of stories that too many people dismiss as not important because they have to do with the ordinary and the every day; the events and the people who make up the majority of life. In other words, most of us. As for Dietrich, he’s a good guy. He proved it Friday at the fundraiser. Turns out he did it for free. On a new adventure of working in radio, Marcia can't resist the written word and spreading what's happening. She gets her exercise feeding her cats and chasing after the rapscallion named Lino.